Ok, I have two things to share with you this lovely Saturday morning. First off, the world's easiest DIY. One of my new year's resolutions was to sew more and learn to be a better photographer, and this new motivation has spilled over into a general idea that I am crafty. 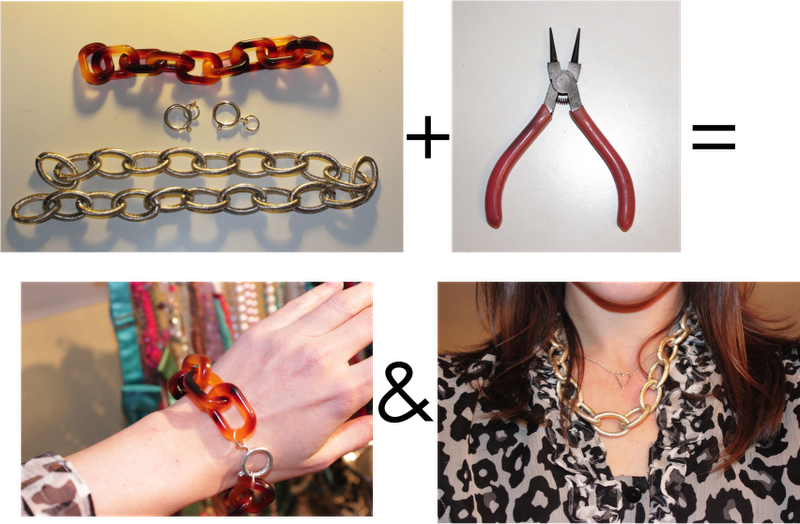 While this might not yet be the case, I am here to show you that no matter you level of craftiness, you too can create DIYs with amazing results with my 5 minute DIY chain jewelry. I picked up two types of chain (plastic tortoise links and silver metal chain) and some basic hook closures from my local Michael's over the holiday. This week I finally completed this project (I guess including procrastination, this project takes about 2 weeks, but that step is not recommended). Using my basic pliers, I attached a ring to one end of each chain, and a closure to the other end, and in less than 5 minutes created a bracelet and necklace! Secondly, I have been actually doing a better job than I expected at keeping resolutions #1 (workout 3X/week) & #2 (drink more water), and have been feeling over all better - I sleep better, I actually CRAVE water, and my jeans fit just a bit less painted on (ha). I even got talked into running for fun by my persuasive roomie, and will for the first time today, be running a 5K. I know I am such a baby, 5K is NOTHING, but it is all about baby steps people! I am dipping my toe into new things, be it DIYs, or 5Ks, and so far so good! Are you trying anything new today? Ooooo super cute and congrats on your first DIY project. And uh - look at all those necklaces - I could go shopping in your closet, LOL. Love love love that mint green necklace to the far right! Keep the DIY projects coming! Love the way it came out! so cute! I love the DIY!! What a great start. I also love the starting small with running. It is hard and daunting to start running races. Good luck with the 5k!! Hey there! great blog, keep going!